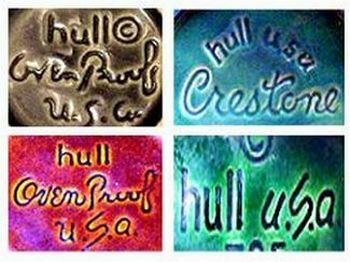 Identifying marks on Hull Pottery can at times be tricky, mainly because many of their wares are signed as simply USA, usually in embossed or raised large letters and occasionally labels (stickers) that can be lost. A pattern or series name and number is often also present, but in many cases, the best way to attribute an item made by Hull Pottery is to compare with other similar examples that have been properly identified. To view a comprehensive list of Hull Pottery marks, please check out our marks4ceramics research service to help you in recognizing their marks and how they changed over the years, which in turn can indicate the age of your collection. To compare with other known Hull Pottery examples in order to specify your pattern and also arrive at a fair estimate of its appraisal value, check out our values4antiques with millions of illustrated priced results for any and all types of antiques and collectibles. Some typical examples are shown below. Although prices for Hull Pottery items are fairly affordable for most collectors, their appeal is constantly increasing with Retro style enthusiasts, primarily because of their soft hues & glazes and interesting shapes. Hull Pottery Assoc. '05 Wisconsin Dells Commem.